Each spring, Columbia County Soil and Water Conservation District hosts their annual Bare Root Tree and Shrub sale offering bare root plants to local residents. These plants are available at a low cost for conservation purposes, but, at the same time add to the beauty of your property. All plants are sold as bare root (unpotted) and range in size from 10" to 24", depending on variety. Orders are accepted from January through mid-March, with plants ready for pick-up at the end of April. All orders are pre-paid. Payment with check or money order must accompany order when it is placed. 2019 Tree and Shrub Sale ordering period has ended. Be sure to mark you calendars for order pick-up. FRIDAY - APRIL 26 - 9 a.m.. to 6 p.m..
SATURDAY - APRIL 27 - 9 a.m. to 1 p.m.
- Please be sure to make arrangements for someone to pick up your order if you are unavailable. - Office is closed on Saturday. Messages will not be answered until after pick up has ended. - Apple and Sweet Cherry trees are not small. They are sold individually, but are typically 4 to 5 ft tall with developed branches. Plan accordingly since they will not fit entirely inside a small vehicle. - Trees should be planted as soon as time allows. Leave in cool, dark place until planted. Thank you for your interest and participation. Enjoy your new trees! 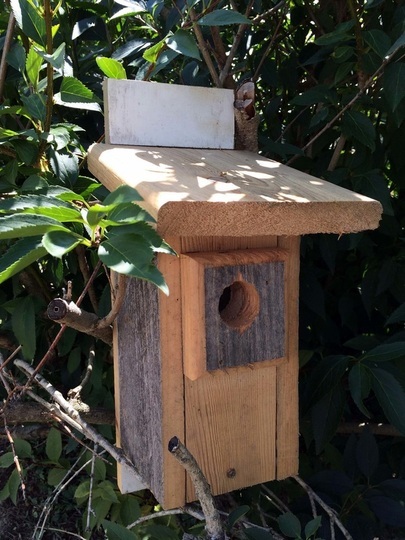 As a service to the public, the District sells Bluebird Houses. These houses can be purchased during our normal business hours. Monday - Friday 8:00 a.m. to 4:30 p.m..
Bluebird houses will, also, be available for sale at our tree sale pickup dates in April.